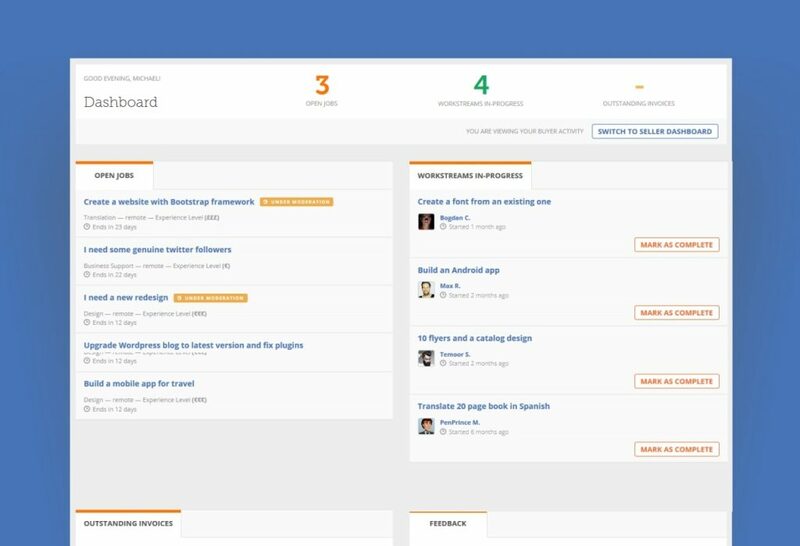 Improved Dashboard is here! See what’s new! We are very excited to announce the arrival of a new and improved Dashboard that is now available to both Sellers and Buyers! You should now be able to view the most important actions you perform on PPH in one brief glance! Buyers can get a quick overview of the number of Open Jobs, Workstreams in progress and Outstanding Invoices. All the information is now neatly organised in separate tiles. This allows you to quickly see which Jobs have pending new messages, complete finished Workstreams, pay outstanding invoices and leave feedback for a Job well done! 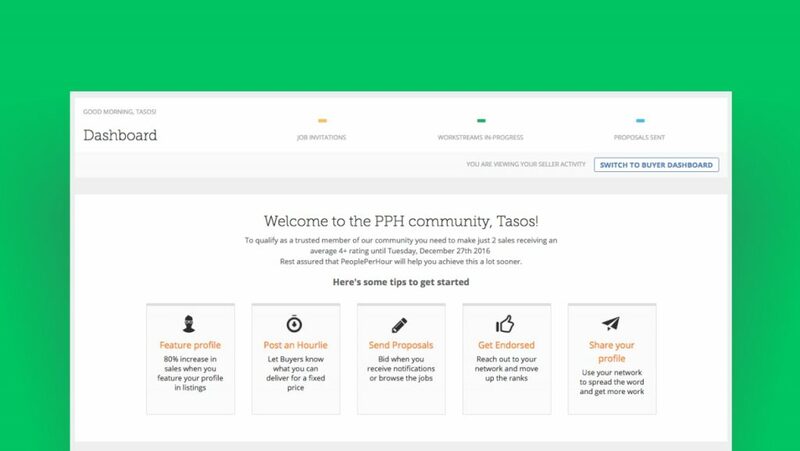 Our Seller Dashboard now provides helpful information to new Sellers by offering them handy tips on how to start selling their services on PPH! You get a quick overview of the Job invitations you receive, Workstreams you have in progress and proposals you have sent. 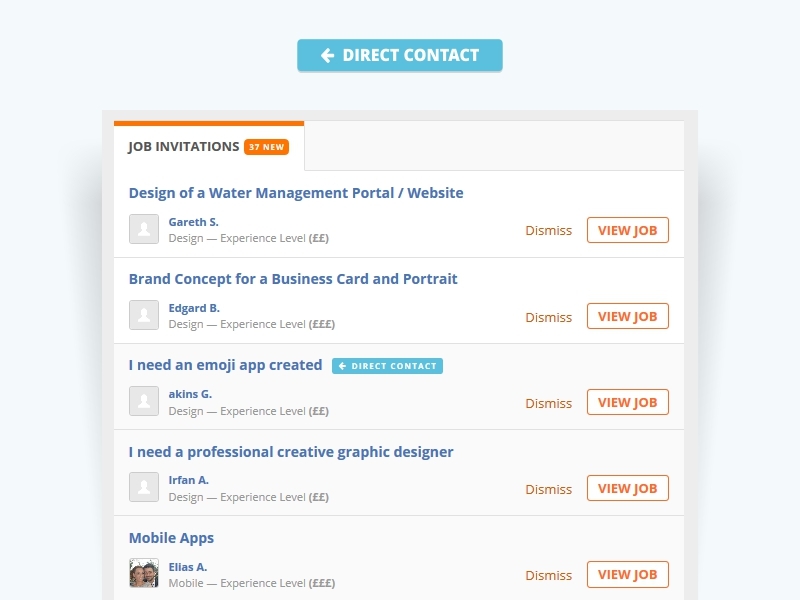 Job invitations sent to you directly from Buyers will be labelled as “Direct Contact”. 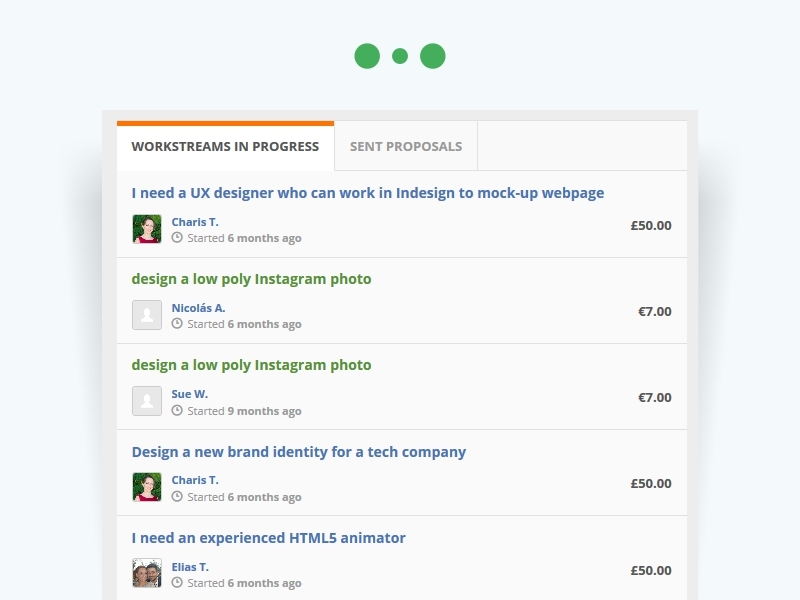 Your Hourlie Workstreams that are in progress will be colour-coded green. But that’s only half of the story! Statistics of Profile Views, Hourlie Views and Billing info are now available for you alongside your Cert Ranking and Score with tips on how to improve them. And if that wasn’t enough, we’re also offering a list of recommended Jobs for you to look at and Send proposals. Happy days! These changes have been introduced in response to the proactive feedback we have received from many of our community members (yes, you!). Your ideas, thoughts and feedback are invaluable to us – please keep them coming! It’s missing a link to the hourlies that we have posted as sellers. I used to find that really useful on the old dashboard. Also, buyer’s don’t always mark workstreams as complete which means that we as sellers end up with hundreds of ‘workstreams in progress’ even though in reality we might actually only have a couple of jobs that we are currently working on, and these then get lost in the long list. I would like to let you know that we are currently working on implementing the changes you’ve mentioned along with a few others that may further improve your experience as a seller. 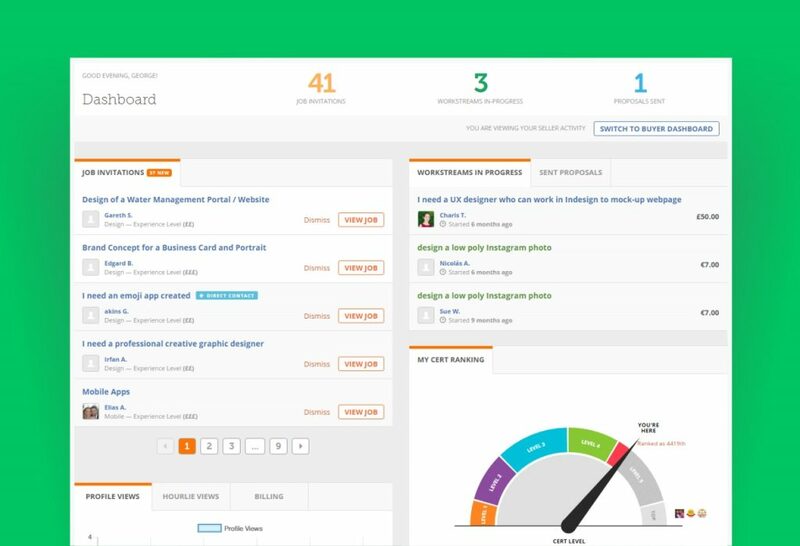 Dimitris the new Dashboard is great and with some additions could be even better. Unfortunately in the same time PPH changed the sorting algorithm of hourlies showing completely no sense results. As I’m new in PPH, I missed the old Dashboard. But one thing can tell without any hesitation that this new dashboard is just AWESOME. Really Smooth and easy to navigate. Though there are still some bugs. One of them is (In Work stream or Sent proposal tab) you’ll find “new message” even after checking all the messages. It isn’t responsive yet like the navigation icon. Regarding the dashboard, I mostly like this apart from the issues that Rebecca has already raised that are being worked on. I also find it a little slow to load. My main issue is the new hourlie search algorithm which is useless. I have also noticed my hourlie views plummet since this change. I hope that PPH address this soon! Just to give another follow up example to my above comments, I have a popular hourlie with just three tags, “wordpress”, “seo” and “search engine optimisation”. My hourlie isn’t anywhere in the first ten pages anymore – and most of the first page results have nothing to do with WordPress at all. In fact less than 20% of the first ten pages of listings have anything to do with WordPress. I’m afraid I don’t think the new changes are working as you expected. Like others have mentioned, hourlie search results seem bad. Favours people with little to no sells/feedback and again pushes out the people who have been here the longest and built up a good profile. Hello everyone and thanks for your feedback! We would like you to know that we’ve performed a series of tests and verified that our hourlies algorithm works as expected. The TF-IDF algorithm has proven its value in multiple cases. However, it is often a good idea for one to update an hourlie with the most descriptive tags possible and also contact our CS to ask for the hourlie to go through moderation again, especially if it was significantly changed since the time it was approved. For reference, the keywords/tags for the first hourlie that shows when searching “WordPress SEO” are “guest posting,link building,seo”. This is similar for the other 5 top results. There is clearly no good reason why these should show above yours when you are searching for something more specific. I have delivered a project to the client successfully with invoices and all other process but It is still mentioning there in workstreams in progress as Client doesn’t know how to close the project. Even I’m not getting it. Can anyone explain me?